After the user Registers for an event (he goes to cart and pays, etc.) the next time he visits the page, the event for which he registered now shows a less emphasized Unregister button, which does the exact opposite of what it did until the event was purchased. Is it a good practice to have the same button change it's function or is it bad and confusing? You can change the button to reflect the only available action, but separate the display of state. You've replaced the button label with the only available action: reverting (unregistering). 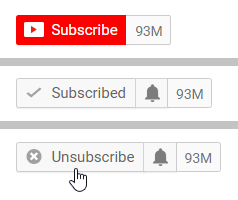 Where it starts to get a little confusing is you have a checkmark alongside the button label. One approach is to separate them. Separate the status 'You are attending' from the action. Since the primary action when scanning the list is Register, you can make the Unregister button more subtle. Depending on the business goals, if you need to deemphasize the act of unregistering, you can perhaps make a subtle link. This example emphasizes the current state 'Attending' so it's clear at a glance. This also uses distinct language to more clearly differentiate state from action. 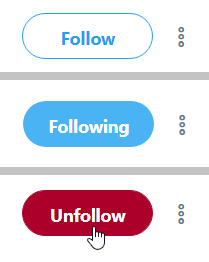 For comparison, social media sites usually have something like that button for following/unfollowing. Do not "less emphasize" it unless it is a requirement! Do not jeopardise your users' experience in the favor of discouraging an action! 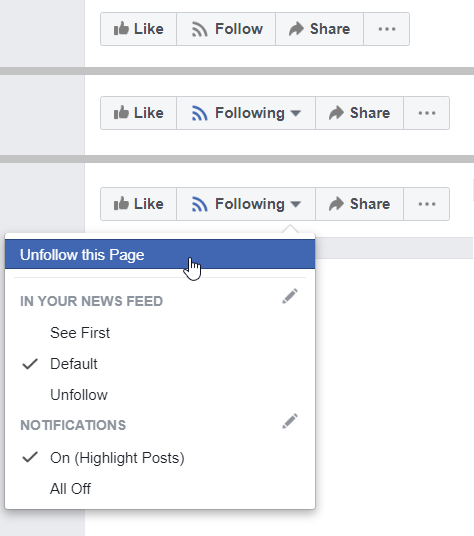 These are two different buttons with two different functionalities that are EQUALLY important to the users. Apparently users should be able to Register and to Unregister. Similarly I am able to buy from Amazon and I am able to make a return or cancel an order. Although Amazon would prefer less returns/cancellation happening, they do/should not make the Return/Cancel buttons confusing and less accessible. *Less emphasizing does not mean confusing the user and making the task hard to achieve. *There is nothing wrong with having the "Unregister" button replacing the "Register" button. Show something like "Already registered" label (with the check-mark maybe) for users who are already registered and coming back to revisits the page. Display the "Unregister" button in blue just like the "Register" button and remove the check-mark that you added next to "Unregister". See suggestions in the update sections below. I just noticed Mike's answer (I think it was posted a couple minutes before mine). I echo his idea: "Depending on the business goals, if you need to deemphasize the act of unregistering, you can perhaps make a subtle link". Not the answer you're looking for? Browse other questions tagged interaction-design buttons layout design-patterns information-design or ask your own question. How little is too little padding between button text and its button border? Evidence of Button-action and Link-action in the same scope? Button text in table column - 'Open' or action name?